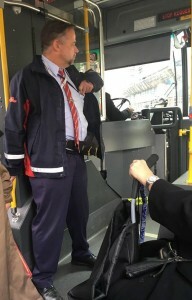 I was on the Bay bus when I noticed an off duty TTC driver a few steps away. He had jumped up to offer his seat to an elderly European lady. She started talking to him in a very loud voice and he was incredibly polite, answering all of her questions and comments respectfully. I liked that. At one point a man got on and was using sign language. Unbelievably, the off duty driver began mimicking the sign language in an effort to communicate back. I thought, wow, this man is a quick learner. With each kind gesture, I could see him stand a little taller and look a little prouder. Finally he said loudly, “this next street is a real NIGHTMARE…. coming up, Elm Street”. He laughed at his own joke and I could tell he was in his element. The European lady said “you are great, not like the other drivers on here”. He said… “ma’am, honestly, this can be a stressful job”. She said, “this is a stressful city… and this is a stressful life, no excuse”. We were all silent for a second pondering that. I thought, damn right girl, you nailed that. I got off at the next stop and he had stepped off to let us all pass by. I said, “I love your personality and positivity. Don’t change – the TTC needs more of this”. He was so taken aback that I felt like he wanted to salute me. He nodded emphatically and said, ‘thank you so much, I appreciate that’. His actions inspired everyone around him and it made me realize the importance of encouraging what you want more of, rather than complaining about what you want less of.